Wahoo! It's finally here, the time of year when we can begin to enjoy the beautiful bounty of our gardens. My first harvest of radishes and tasty spinach has been a very pleasurable one! Here's to a wonderful summer of delicious home grown food. 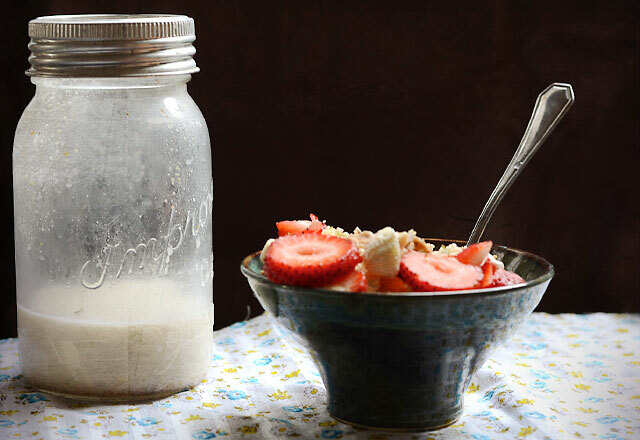 This is a simple nutritious and delicious recipe for almond milk. If you can get your hands on a nut grinder it's the way to go as grinding nuts in your coffee grinder can wear it out (I know this from experience)! 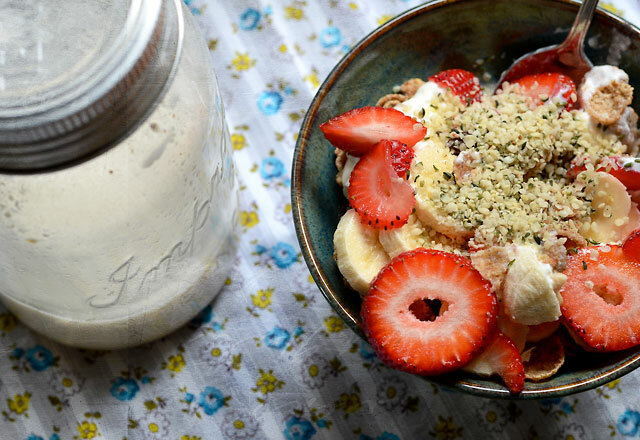 This is a great base to start off any shake or simply enjoy with a bowl of cereal. Warning, these are highly delicious! For the scones: Place an oven rack in the middle of the oven. Preheat the oven to 375 degrees F. Grease baking sheet or use parchment. Set aside. Grind rosemary, but set aside some whole pieces (1/2 tbsp) to add in later. Mix together the flour, sugar, baking powder, ground rosemary, salt, and butter until the mixture resembles a coarse meal. Gradually stir in the cream and whole rosemary pieces until the mixture forms a dough. On a lightly floured work surface, roll out the dough into a 1/2-inch thick, 10-inch circle. Using a knife cut like a pizza into triangle pieces of dough and put on the prepared baking sheet. Using an index finger gently make an indentation in the center of each pastry heart. Spoon a 1/2 teaspoon of jam into each indentation. Bake for 15-18 minutes, take out and glaze the scones and then place them back in the oven until the edges are golden brown (should be only another 1-2mins). Transfer the cooked scones onto a wire rack and cool for 30 minutes. For the glaze: In a small saucepan over medium to low heat, mix together the lemon juice and powdered sugar until smooth. Gradually add the water and continue to heat while constantly stirring. Stir until mixture thickens. Using a spoon, drizzle the glaze over the scones. These are a very tasty veggie burger, and they're super fun to make! Pick through the lentils and rinse thoroughly. Stud each of the onion quarters with a clove. In a lidded medium saucepan, heat the 1 teaspoon oil over medium high heat. Add the onion quarters, ginger pieces, garlic cloves, cinnamon stick, and bay leaf. Stir, then cover and cook for one minute, until fragrant. Add the lentils and 2 cups water. Bring to a boil, then reduce to a simmer. Cover the pot and cook for 15-20 minutes, until the lentils are tender. Discard the aromatics (the onion, ginger, garlic, cinnamon stick, and bay leaf) and pour off any excess liquid. Heat the remaining 2 tablespoons oil over medium-low heat. Add the chopped onion, ground allspice, ground cinnamon, ground cloves, and cayenne. Fry for about 12 minutes, stirring frequently, until the onions begin to caramelize. Reduce the heat and add the garlic and ginger. Cook for about five minutes more, until the onions are fully cooked. Set aside 1/2 cup of the cooked lentils. In a food processor, combine the remaining lentils, eggs, and onions, and pulse until thoroughly combined. Transfer to a mixing bowl. Add the reserved lentils, salt, parsley, lemon juice, and breadcrumbs. Adjust seasonings. Using your hands, shape the mixture into five patties (or if you want to mimic the photo, you can make about a dozen “slider” mini-burgers). To panfry: heat two tablespoons olive, grapeseed, or vegetable oil in a skillet over medium heat. Add the burgers, in batches if necessary to avoid crowding, cooking 5 to 7 minutes on each side until browned and firmed. To bake: Preheat oven 350-degrees. Place burgers on a lightly greased baking sheet for 15-20 minutes, until browned and firmed in the middle. Flip them over halfway through the baking time. **I like to lightly panfry my burgers and then bake them in the oven. We love to serve these with homemade tzatziki and these are best enjoyed when paired with some delicious homemade french fries. Enjoy! 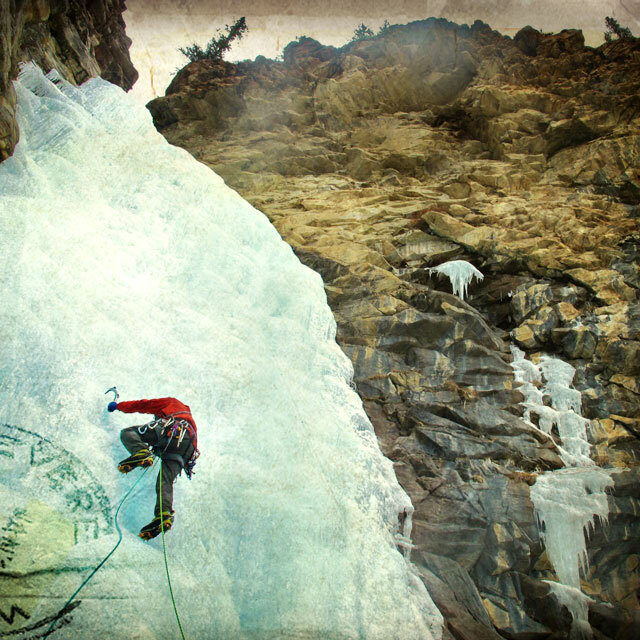 Got out last weekend for some incredible iceclimbing at Kerkeslin Falls in Jasper. My first multi-pitch iceclimb, I'm hooked! Also made a delicious mutton curry from the Vij's cookbook...mmmm. Will post some pics soon! 1.Put 2 tbsp ghee or oil on medium heat in a large, heavy stockpot. Add cumin seeds and sauté until they sizzle, about 45 seconds. Add onions and sauté until golden brown, about 8 to 10 minutes. Add garlic and sauté 2 to 3 minutes, or until golden brown. Stir in ginger. After 1 minute, add ground cumin, coriander, turmeric, cloves, cinnamon, cayenne and salt. Cook on medium heat, stirring regularly, for 5 to 10 minutes or until ghee (or oil) separates from the spices. Add another tablespoon of ghee or oil if spices are sticking to the bottom of the pot. 2. Add tomatoes and cook for 3 to 4 minutes, until ghee (or oil) separates again and glistens. Stir in yogurt and cook for another 1 to 2 minutes, then add water (add an extra cup of water if serving with rice). Bring to a boil, then remove from the heat. 3. In another large, heavy frying pan, add 1/8 cup oil. On medium to high heat, sauté lamb (or goat), stirring regularly, until you notice small, thin lines of blood on the meat. Remove from the heat and transfer meat to the stew. 4. Return stew to medium-low heat and cook covered, stirring occasionally, for 2 hours or until meat is cooked through. Add more water, 1/2 cup at a time, if the stew becomes dry while cooking. This should be a moist, thick curry. 5.To Serve: Just before serving, remove cinnamon stick and cloves. Stir in cilantro. Ladle equal amounts of curry into each bowl. Mix the yeast with the sugar and 1 C flour and let activate for 10-20mins. you'd like crank up the heat to broil for 2-5 mins to brown the cheese!